In 2014, tanks rolled down the streets of Ferguson, Missouri, USA, flanked by Robocops clutching oversized weapons. The police wanted to end the protests against the shooting of black teenager Michael Brown. But why did they act like an army? And how did they get those weapons? The militarisation of the police became front-page news. Authorities scrambled to respond and called into question the US government’s program that distributes military hardware to local police forces. President Obama promised to look into it and asked that .50 caliber guns and weaponised aircraft be cut from the long list of available weaponry. Trump rescinded that directive last September. But the militarisation of the police goes deeper than any single government program. Defense and security industries are powerful players in policing circles, influencing police strategy, including the methods of controlling protest. Since the late 1990s, police have used pepper spray, barricades, riot control helmets, shields, stun grenades, tasers and sound cannons against many protesters. Business is booming. The global less-lethal weapons market was $6.32 billion in 2016 and is expected to reach $11.85 billion by 2023. The acquisition of increasing numbers of weapons is happening in Canada, too. Speaking about the purchase of large numbers of high powered rifles, even the Commissioner of the Royal Canadian Mounted Police, Bob Paulson is “afraid of the trend in policing for escalating military-style tools being used by law enforcement to conduct police operations.” Indeed, in the spring of 2015, Montreal police used a combination of arrests, tear gas, stun grenades and pepper spray to disperse anti-austerity protesters. Why do states see protest as an increasing threat? The weapons are only part of the problem, however. They are used against protesters partly because of a logic that sees unpredictable protests, and protests that have the potential to disrupt political and economic systems, as ‘threats’ to national security. Anti-terrorism initiatives rest on this intelligence-led logic. A 2016 RCMP intelligence report described anti-pipeline activists as “a criminal and extremist threat, seeking to promote their 'violent anti-petroleum ideology'.” Such a frame justifies infiltration, militarisation and a pre-emptive response to political authorities and police leadership. Since the early 2000s, police have managed protesters deemed ‘threatening’ with a ‘strategic incapacitation’ approach. In a climate of increasing inequality, the 9/11 attacks, globalising policing networks and defense industry expansion, this strategy was promoted as ‘best practice’ to police forces. Instead of negotiating with movement leaders, police began to combine specialised units, less-lethal weapons, barriers and infiltration to contain, neutralise, pre-emptively arrest and intimidate. This heavy-handed approach first occurred at global justice, environmental and anti-war demonstrations and triggered condemnation by many political authorities and legal advocates, with ensuing class-action suits in the US and inquiries in Canada. The costs associated with this strategy, when combined with longstanding criticisms of racist police brutality, deepened a legitimacy crisis for the police. Since 2014, Black Lives Matter and the Movement for Black Lives have shone a spotlight on the police shootings of unarmed black people. Protests against these shootings make the connection between militarised protest policing and day-to-day racist policing inescapable. In this context, some police leaders are asking how they might regain public trust. A Gallup Poll reported that public trust in the police is at its lowest level in 22 years in the US. There is a need for police to move from the dominant ‘warrior’ mentality’ to a ‘guardian mentality’, says Tracy Meares, a member of the Task Force on 21st Century Policing created by the Obama administration. Despite such recommendations, the shootings, and the protests, continue, as the tools and logics of policing remain unchanged. Indeed, in the Trump era, blunt force is celebrated. After the settlement of a lengthy class-action lawsuit by protesters in 2015 for $13 million, there now appears to be a return to militarised protest policing in Washington D.C. For Trump’s inauguration, the local police spent over $300,000, including $42,000 on less-lethal munitions, including 140 Stinger Rubber Ball Grenades, 140 Rubber Baton Rounds, 140 Stinger rounds and 20 smoke bombs. 230 protesters were charged with felony and riot, which carries up to a decade in prison and $25,000 fine. Such charges are not typically laid en masse. Mara Verheyden-Hilliard, the executive director of the Partnership for Civil Justice Fund said that arrests, "simply based on proximity or shared political views at a march" set a troubling precedent for all protests. She explained that "it means at any demonstration," if a participant or a provocateur commits an illegal act, then "the entire demonstration can be subject to indiscriminate force and large groups of people can be suddenly arrested without notice or opportunity to disperse, and face life-altering charges." Police in St. Louis, Missouri, chanted “Whose streets? Our streets!” as they cleared anti-police brutality activists from the streets. They may be right. Since the 2016 election the LAPD have arrested 462 people in anti-Trump protests, criminally charging only three. In St. Louis, at protests against the acquittal of a police officer who shot Anthony Lamar Smith in 2011, police arrested 307 protesters in 18 days. 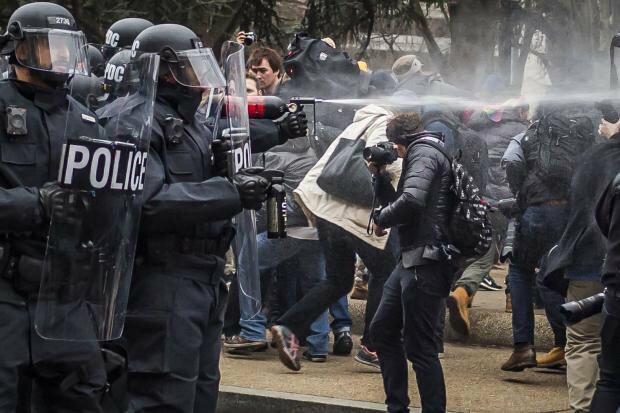 The police there have also used pepper spray, attempted to prevent filming of police actions and kettled the demonstrators into a small area.” Many states are passing laws that limit the right to protest. Resistance is growing to this aggressive policing on the streets and in the courts. The American Civil Liberties Union (ACLU) of Missouri filed a lawsuit against the St. Louis Missouri Police Department over what it called "unlawful and unconstitutional actions" against demonstrators. This past year the confrontations between racist, anti-immigrant and anti-racist protesters have attracted police attention. Despite their access to tanks and riot teams, police have been unable to stop neo-Nazi protesters firing shots and using cars to kill anti-racist protesters. Indeed, police often arrest the anti-racists. What is to be done? The hunger to keep racist and fascist activists from marching in the streets can push those concerned about rising extremism to rely more on the police, demanding that they ‘do their job properly’ and protect society. Such an approach is shortsighted. The police are not our guardians. They are the guardians of a racist, violent society. Police, especially militarised police, cannot stop the rising tide of racism. The police look like an army because companies like TASER and Lockheed Martin are profiting from, and exacerbating this unstable and exploitative system. To build a more democratic, egalitarian society we need to move towards real security, where we protect demands for equity, and ensure room for dissent, not robocops and racists.